(Dr. Naik) Dr. William Campbell spent maximum time on Embryology’… about half his talk - quite a lot on Geology - and touched on other six topics - I’ve noted down. In the field of Geology, we have come to know today - the Geologists, they tell us, that the radius of the Earth is approximately 3750 miles, and the deeper layers, they are hot and fluid, and cannot sustain life. And the superficial part of the Earth’s crust, which we live on, it is very thin - Hardly 1 to 30 miles. Some portions are thicker, but majority one to 30 miles. 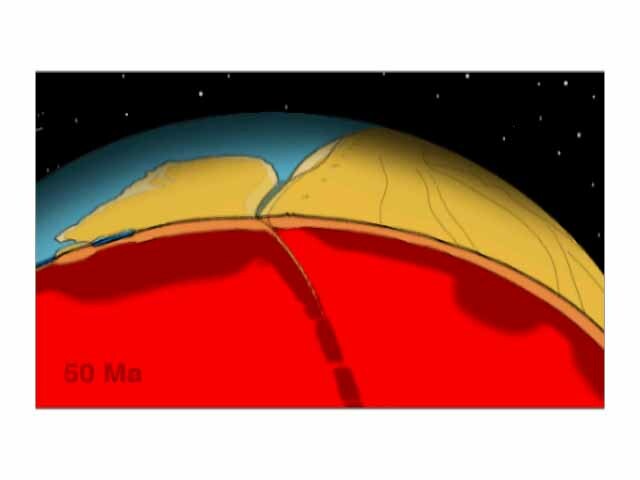 And there are high possibility that this superficial layer, the Earth’s crust - it will shake. It is due to the ‘Folding phenomenon’, which gives rise to mountain ranges, which gives stability to this Earth. And Qur’an says in Surah Nabaa, Ch. No. 78, Verse No. 6 and 7…‘We have made the Earth as an expanse…. (Arabic) ….and the mountains as stakes.’ The Qur’an does not say, mountains were thrown up as stakes… mountain as stakes. Arabic word ‘Autaad’ means ‘stakes’… meaning ‘tent peg’. And today we have come to know in the study of modern Geology, that mountain has got deep roots. This was known in the second half of the 19th century. And the superficial part that we see of the mountain is a very small percentage. The deeper part is within - Exactly like a stake how it is driven in the ground. You can only see a small part on top - the majority is down in the ground - or like a tip of the ice berg…you can see the tip on the top and about 90% is beneath water. The Qur’an says in Surah Gashiya, Ch. 88, Verse No. 19, and Surah Naziat, Ch. No. 79, Verse No. 32 ….. (Arabic) …. And We have made the mountains standing firm on the Earth’. Today after modern Geology has advanced, and Dr. William Campbell said that… ‘By the theory of Plate tectonics - It was propounded in 1960, which gives rise to mountain ranges.’ The Geologists today do say that the mountains give stability to the Earth - Not all Geologists, but many do say. (Ali Sina) Dr. Campbell already explained how mountains are formed in a scientific language. Everything Dr. Naik says is just absurdity. He says “not all geologists" but many of them say mountains give stability to the Earth. He thinks science is like Islamic jurisprudence that each mullah can have his interpretation. Will he give us a few names so we can verify what exactly these "geologists" say and check their credentials? I hope they are not graduates from Al Azhar University. The Earth's surface is made up of a series of large plates (like pieces of a giant jigsaw puzzle). These plates are in constant motion traveling at a few centimeters per year. This motion is called continental drift. The edges of these plates, where they move against each other, are sites of intense geologic activity, such as earthquakes, volcanoes, and mountain building. When two tectonic plates collide they press against each other until the land is lifted and folded over itself. This movement often causes one plate to push on top of another one. 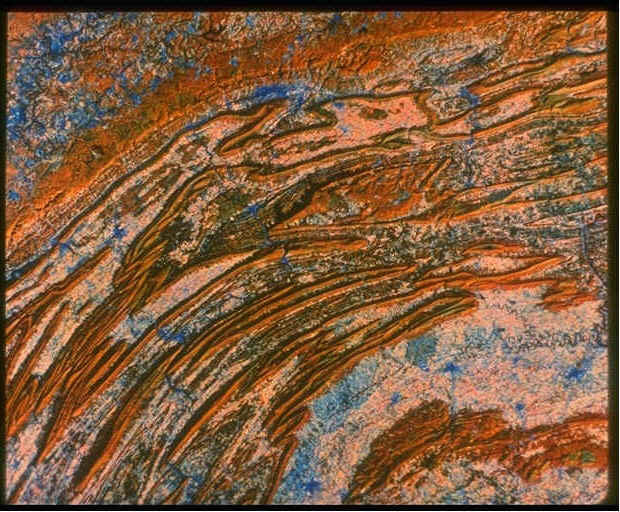 As one plate slides downward into the earth, it begins to melt pushing the other plate upwards forming mountain ranges. 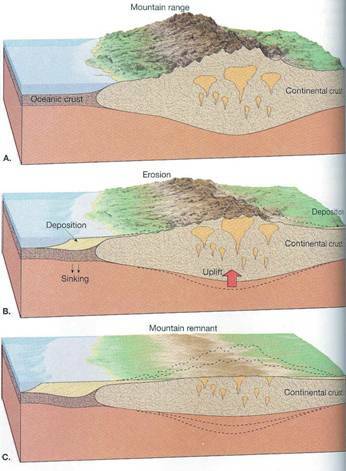 This is an example of a divergent plate boundary (where the plates move away from each other). The Atlantic Ocean was created by this process. The mid-Atlantic Ridge is an area where new sea floor is being created. As the rift valley expands two continental plates have been constructed from the original one. The molten rock continues to push the crust apart creating new crust as it does. As the rift valley expands, water collects forming a sea. The Mid-Atlantic Ridge is now 2,000 metres above the adjacent sea floor, which is at a depth of about 6,000 metres below sea level. The sea floor continues to spread and the plates get bigger and bigger. This process can be seen all over the world and produces about 17 square kilometres of new plate every year. The ocean floors are continually moving, spreading from the center and sinking at the edges. When continental plates collide the melted rock rushes upward along cracks and weak spots, bursting out as fiery volcanoes. Dome Mountains are formed when melted rock pushes its way up under earth. Fault Block Mountains are formed when faults or cracks in the earth's crust force some materials or blocks of rock up and others down. Fold Mountains are formed as layers of the earth react to forces pushing in on either side, much as a piece of paper folds when pushed together. Volcanic Mountains are formed from by hardened lava after spurting out of a volcano. Cross-section of the French Alps: from University of Leeds. No sign of roots! Satellite view of Pennsylvania Appalachians is an example of fault block mountains. 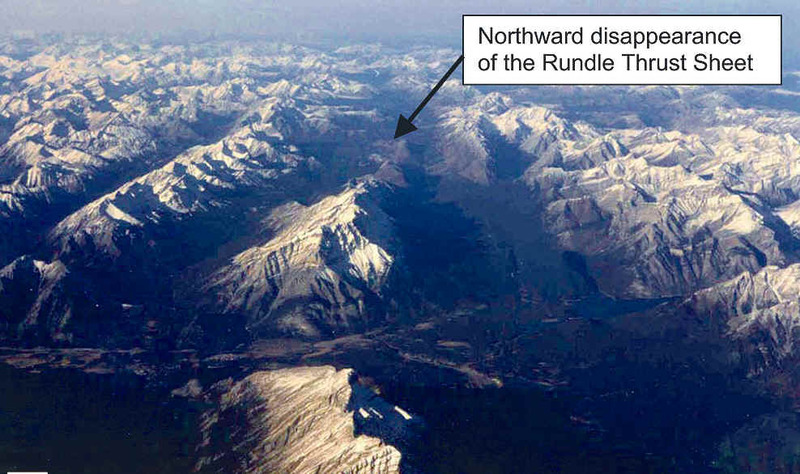 View north over termination of Rundle Thrust Sheet, Rocky Mountains. What happens if push the tablecloth from its edge sliding it across the table? It wrinkles. That is more or less how mountains are formed. They are wrinkles caused in the crust of the earth. Ironically without these devastating earthquakes life on Earth could not have evolved. The movement of continents allows carbon dioxide to be released to the atmosphere. This is essential for the photosynthesis of plants and it also keeps the temperature of the Earth constant which is necessary for life to evolve . If you have Quicktime installed, you can click on these animations and see how mountains are formed. This should suffice as proof that the Quran is wrong and mountains are not like pegs to keep the earth from shaking. Remember that Dr. Naik repeated several times, "All we need is one error to prove it is not from God". Later I will explain where the idea of mountains being like pegs and holding the earth beneath us from shaking with us has come from. The lithosphere is topped by a relatively lightweight crust. Seismology reveals that the crust varies in thickness; it is thin under oceans, thicker under continent, and thicker under high mountains. In the above picture the horizontal distance is much larger. These are not scientific statements. Every illiterate person living in the 7th century knew that the mountains are fixed. Also mountains do not resemble pegs. (Dr. Naik) The function of the mountain in the Qur’an, is given to prevent the Earth from shaking. Nowhere does the Qur’an say that the mountain prevents the earthquake. (Ali Sina) What could possibly "preventing earth from shaking" mean except earthquake? (Dr. Naik) And Dr. William Campbell said - He writes in his book, and even the talk, that… ‘You find in the mountains regions, there are various earthquakes, and mountains cause earthquake.’ Point to be noted - Nowhere does the Qur’an say that mountains prevent earthquake. The Arabic word for ‘earthquake’ as Dr. William Campbell knows Arabic, is ‘zilzaal’ or ‘zalzala’- But the words used in these three Verses I quoted, it is ‘Tamida.’ ‘Tamida’ means ‘to shake’, ‘to ‘sway’, ‘to swing.’ And Qur’an says in Surah Luqman, Ch. 31, Verse No. 10, as well as Surah Nahl, Ch. No. 16 Verse No. 15…‘We have put on the earth mountains standing firm, lest it would shake with you. It is ‘tamide bikum’…‘Shake with you’, Indicating, if the mountains were not there, if you would have walked, if you would have moved, even the earth would have moved with you - If you would have swayed, even the earth would have swayed with you. And we know normally when we walk on the Earth, the Earth does not shake, and the reason for this is, according to Dr. Frank Press and Dr. Najjat who is from Saudi Arabia, and he wrote a full book on the Geological concepts in the Qur’an, answering almost every thing what Dr. William Campbell has said - in detail. (Ali Sina) High mountains are formed through collision of tectonic plates. In planets where tectonic plates do not exist or do not migrate, there are no continental collisions, earthquakes do not take place and mountains do not form. As the result life does not evolve. There are nearly 70 planets and moons in our solar system. None has mountain ranges like those on Earth, suggesting tectonic plates are not moving. Yet it is absurd to say that one cannot walk on the surface of these planets and moons without making the ground beneath them shake. Can anyone say anything stupider than this? In fact the reverse is true. In planets where high mountains don't exist, the ground is very stable. (Ali Sina) Note that this shaking, according to Dr. Naik is not caused by the volcanic eruptions or tectonic movement. It is not the kind of earthquake we know. It is something else. This shaking is the result of people waking. But as everyone knows, the earth does not shake when we walk on it. The reason? It's thanks to the mountains that prevent this shaking. How can even one suggest that tiny beings like humans can make a continent shake by simply walking on it? This goes beyond absurdity. It's outright asininity. (Ali Sina) What a ridiculous analogy! Patients go to hospitals AFTER they get sick because they are living and thinking beings and that is where they can get medical attention and get better. They do not become sick in hospitals (unless the hospital is in an Islamic country with Islamic hygiene). Is Dr. Naik trying to compare earthquake, a natural phenomenon, to humans? Do the earthquakes happen first elsewhere and then decide to conglomerate in mountains? This analogy is utterly ridiculous; yet Dr. Naik’s Muslim audience became so elated that they spontaneously cheered and applauded. One black guy was almost falling off his chair of excessive laughing. What these people were laughing at? At their own stupidity? Now the world can see them and laugh at them. It’s as if the more stupid is a statement, the more Muslims enjoy it. This reveals the deplorable intellectual bankruptcy of the wretched Umma. Believe me, absurd thinking is the trait of Muslims. Sometime ago I read an essay about a Muslim child asking his religious teacher that the Quran says Jinns will be sent to hell to be punished but the the Quran also says that Jinns are made of fire, so how fire can be hurt by fire? The teacher slapped the child and asked him if it hurts? The poor lad responded yes, with tears in his eyes. "Like that! ", responded the teacher. "My hand is flesh and your face is flesh but it still hurts". Foolish Muslims think this is such a great reasoning. This is the fallacy of wrong analogy. But the Muslim brain is not equipped with enough rationality to think deep. He WANTS to believe and any nonsense will do. There are several sites that have written against me. I receive numerous emails from Muslims who have neither read my articles nor those written by Muslims trying to refute me. And yet these people tell me that I have already been refuted and give me links to the same silly sites. They WANT to believe that I am refuted. They will believe anyone who claims he has refuted me without searching the truth of that claim. The Muslim mind works in bizarre ways. Here Dr. Naik is trying to explain with this harebrained example why most of the earthquakes happen in mountainous regions. But didn't he say that the Quran is not speaking of earthquake and that tamida is not zilzala? If the Quran is not talking about earthquake at all, why he tries to justify this verse with this silly example? If he is satisfied with his answer that tamida is the result people walking on earth, why talk about earthquake? Why cause more confusion? It's because the more confused is your audience the better you can fool them. Dr. Naik is smart enough to know that ‘tamida bikum’ or ‘to prevent the earth from shaking with you’, is a bit too stupid to be swallowed even by Muslims who would generally gobble any nonsense eagerly, so he amuses his audience by telling them that it is okay that earthquakes mostly happen in mountainous regions, despite the fact that the Quran says mountains are like pegs that prevent earth from shaking with a ridiculous example of patients and doctors. (Dr. Naik) In the field of Oceanology, the Glorious Qur’an says, in Surah Furqan, Ch. No. 25, Verse No. 53, that…‘It is Allah who has let free two bodies of following water - One sweet and palatable, the other salt and bitter. Though they meet, they do not mix. Between them there is a barrier which is forbidden to be trespassed. Qur’an says in Surah Rahman, Ch. 55 Verse No. 19 and 20……. (Arabic) ……‘It is Allah who has let free two bodies of flowing water. Though they meet, they do not mix. Between them there is barrier, which is forbidden to be trespassed.’ Previously the commentators of the Qur’an wondered…‘What does the Qur’an mean? We know about sweet and salt water - But between them there is a barrier - though they meet do not mix. Today after advancement of Oceanology, we have come to know, that whenever one type of water flows into the other type of water, it looses its constituents, and gets homogenized into the water it flows. There is a slanting homogenizing area, which the Qur’an refers to as ‘Barzak’ ‘unseen barrier’ And this has been agreed upon by several Scientists, even of America , by the name of Dr. Hay - he is an Oceanologist. Sweet and salt water is an observable phenomenon, I agree - But people did not know that there was an unseen barrier, until recently. The Scientific point to be noted here is the ‘Barzak’ - not the sweet and the salt water. (Ali Sina) If the separation of sweet and salt waters is an observable phenomenon, as it seems that everyone agrees, then how could no one know about it until "the advancement of oceanology" made its knowledge possible? What Muhammad is referring to is precisely that and nothing more. There is no “invisible barrier” between two waters, which is “forbidden to be trespassed”. There is no barrier of any kind - no barzakh at all between waters. Waters don’t mix immediately because of different temperature and density but they eventually do, just like when you pour cream in a cup of coffee. It takes time to mix; that is why you stir it. Those who saw this phenomenon must have relayed their observation to others using figurative speech saying waters don’t mix AS IF there is an invisible barrier between them. Our ignorant Muhammad took this literally and claimed there is an “invisible barrier” between them, which is “forbidden to be trespassed”. Nothing can be further from the truth. All waters mix and there is no barrier, invisible or otherwise between them. When two rivers, carrying sediments of different colors meet, or when sweet water coming from rivers flows into the blue salty water of the sea, one can see the line of demarcation sometimes stretching for miles until they gradually blend. Where the waters merge, i.e. what Dr. Naik refers to as the “slanting homogenizing area”, is not a “barrier”. It is the opposite of it. There the waters are not forbidden to trespass but actually merge. It is amazing that Muslims emphasize on the flagrant errors of the Quran as its miracles. Who would buy this nonsense except a totally ignorant person? There were a group of Arabs who collected the data dealing in the Qur’an about ‘Embryology’ and the Hadith dealing with Embryology. And they presented it to Professor Keith Moore, who was the chairman and the head of the department of ‘Anatomy’, in the University of Toronto , in Canada - And at present he is one of the leading scientists in the field of ‘Embryology.’ After reading the various translations of the Qur’an, he was asked to comment, and he said… ‘Most of the Verses of the Qur’an and the Hadith are in perfect conformity with Modern Embryology. But there are a few Verses which I cannot say that they are right neither can I say that they are wrong, because I myself don’t know about it. And two such Verses were the first two Verses of the Qur’an to be revealed, from Surah Iqra or Surah Alaq , Ch. 96 Verses No. 1 and 2 which says…(Arabic)… ‘Read, recite or proclaim in the name of thy Lord, Who created, Who created the human beings from something which clings - a leech like substance’. Regarding Dr. William Campbell’s statement that…‘To analyse the meaning of a word, we have to see what was the meaning at that time when it was revealed’-At that time when the book was written. And he rightly said that to analyze the meaning, we have to analyze the meaning at the time it was revealed, and to the people whom it was meant for. Is Islam for All Mankind? (Dr. Naik) As far as this statement of his is concerned, regarding the Bible, I do agree with it totally - Because the Bible was only meant for the children of Israel , for that time. It is mentioned in the Gospel of Mathew, Ch. No. 10, Verse No. 5 and 6, Jesus Christ peace be upon him tells his disciples… ‘Go ye not in the way of the Gentiles.’ Who are the Gentiles? The Non-Jews, the Hindus, the Muslims. ‘But rather go to the lost sheep of the house of Israel .’ Jesus Christ peace be upon him said in the Gospel of Mathew, Ch. No. 15, Verse No. 24… ‘I am not sent, but to the lost sheep of the house of Israel .’ So Jesus Christ and the Bible were only meant for the children of Isreal. Since it was meant for them, to analyze the Bible, you have to use the meaning of the word, which was utilized at that time. But the Qur’an was not meant only for the Arabs of that time. Qur’an is not meant only for the Muslims. The Qur’an is meant for the whole of humanity, and it is meant to be for eternity. (Ali Sina) Here again the Muslim audience broke in applause and the sign of joy was visible from their countenance. To them it was victory after victory. However, had Dr. Naik told them that the Quran says that Muhammad has come only for the Meccans alone and the people around it they would not have rejoiced that much. 006.092 And this is a Book which We have sent down, bringing blessings, and confirming (the revelations) which came before it: that thou mayest warn the mother of cities and all around her. 042.007 Thus have We sent by inspiration to thee an Arabic Qur’an: that thou mayest warn the Mother of Cities and all around her. 036.006 In order that thou mayest admonish a people, whose fathers had received no admonition, and who therefore remain heedless (of the Signs of Allah). The people of the Book, i.e. the Jews, the Christians and perhaps the Zoroastrians had their own messengers and their guidance. The only people who had not received guidance were the Arabs, specifically the Arabs of Mecca and its surrounding. So, it is clear that Muhammad claimed that he had come only for the Quraish and not for the people of the Book and the rest of mankind. Of course, as he became powerful, his ambitions grew and he changed his mind later. Few Muslims know about these verses. What do they say about them? If they truly believe that the Quran is the word of God, they should stop their da'wa and Jihad. The people of Mecca and its surrounding have already converted to Islam. If Muslims believe that the Quran is the word of God, how do they dare to disobey Him and make da'wa elsewhere. Even if Muhammad said they should attack other countries and convert others into Islam, they should not listen to him but do what the Quran says. Whose word is more important? That of Allah or that of Muhammad? These verses should also convince the non-Arab Muslims, including the Egyptians, the Syrians, the Iraqis and all others now known as Arabs that Islam is not for them. Islam is only for the Meccans and its surrounding. They must leave Islam, if they truly believe that the Quran is the word of God. (Ali Sina) Verse 14:52 says “Hatha balaghun lilnnasi”. Nas is people – any number of people. It could be people gathered in a room. It could refer to the inhabitants of a village, a town, a country and not necessarily ALL Mankind. For example nas is used in verse 7.116 when talking about the magic performed by the magicians of Pharaoh who bewitched the eyes of the people ‘nas’. Are we supposed to understand that all mankind were bewitched? The same word is used in 2:185, 39:4 and 21:107. In all these verses Nas means "people" and not all mankind. If we assume that the word 'nas' used in these verses means all mankind then we have to admit that there is flagrant contradiction in the Quran for the verses 6:92, 42:7, 32:3 and 36:6 clearly state that the Quran is for the people of Mecca and its surrounding. However, Muhammad also claimed to have been sent to "creatures of both worlds". lilAAalameen. means everything in both worlds. (That includes dogs and pigs.) That is because he was a megalomaniac narcissist and narcissists talk big. He even claimed to have come as guidance for Jinns, which are mythical beings. Muhammad ibn Ali has narrated that Muhammad said: "Among all the people of the world God chose the Arabs; from among the Arabs he chose the Kinana; from Kinana he chose the Quraish; from the Quraish he chose Bani Hashim; from Bani Hashim he chose Me. [Tabaqat V. 1 p. 2] This man was full of himself - a true narcissist. So much for the alleged equality in Islam. Arabs are the chosen race. Arabs have known that always and they treat non Arab Muslims with disdain. If you are a non-Arab Muslim, you are accepting to be inferior. (Dr. Naik) So as far as the Qur’an is concerned, you cannot limit the meaning only for that time, because it is meant for eternity. So one of the meaning of ‘Alaqa’… is ‘leech like substance’ or ‘something which clings.’ So Professor Keith Moore said… ‘I did not know whether the early stage of the embryo looks like a leech’ And he went into his laboratory and he analyzed the early stage of an embryo under a microscope and compared it with the photograph of a leech, and he was astonished at the striking resemblance. This is a photograph of a leech, and human embryo. The truth about embryology is already explained by Dr. Campbell. He demonstrated the pictures showing that scientifically speaking, there is no resemblance between the human embryo and leech. Furthermore he explained in detail where Muhammad got his erroneous idea about embryo being a congealed clot of blood, like leech and chewed meat. He got it from ancient Greek philosophers. These ideas were popular among the ordinary Arabs at the time of Muhammad. They were wrong and so was Muhammad. As for Alaqa, Dr. Campbell also proved that in Arabic, it means clot and not something that clings as Dr. Bucaille has suggested. Dr. Campbell also showed that all stages of the growth of the embryo described in the Quran are wrong. He demonstrated this with pictures. No one can prove something different than what the X rays reveal. (Dr. Naik) What Dr. William Campbell showed you is the other perspective of it. If I show this book - it looks like a rectangle - If I show you like that, it is a different perspective. That diagram is given in the book - The diagram which you saw on the slide is even there - And I’ll deal with it InshaAllah. (Ali Sina) Here again the gullible audience became euphoric and clapped without realizing that Dr. Naik is engaging in the fallacy of suppressing the evidence. Dr. Campbell showed the picture of the embryo from the front and from the side. Dr. Naik wants to convince his audience that they should look at it from one angle only – the angle that it most resembles a leech. Of course one who is determined to be fooled would be willing to look at things by standing on his head, if that helps him to see them from the exact angle that would reconfirm his unreasoned faith. That is why Muslims are unable to see the truth. Their tunnel vision does not allow them to see things from all angles. If only they changed their perspective a little, they would see that Islam is nothing but a big lie. As-Saghaanee (d.650) said, this hadith is "maudu (fabricated)" ['al-Ahaadeeth al-Mawdoo'aat' of as-Saghaanee (pg. 7)] and likewise al-Albaanee ['Silsilah ad-Da'eefah' (1/450 no.282)] ash-Shaykh Mulla Alee Qaaree (d.1014) said, "maudu, but it's meaning is correct."